Teens and adults from La Jolla Community Church answer the call to work on residential projects around San Diego. 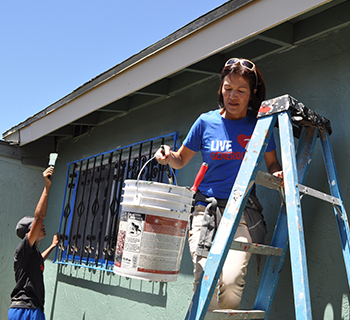 These builds funded by Thrivent Financial are home repair projects to improve existing, degraded homes. Habitat for Humanity provides materials, expert supervision, tools, and lunch. Thrivent Financial fully funds the project fee. Habitat offers two types of revitalization projects that this team serves on. The first build that LJCC participated in was in August of 2015. If you or someone you know would like to serve with John Wilson and the team, let us help connect you with him. For more information, contact the church office at Info@LJCC.org. The Military Outreach Ministry at La Jolla Community Church supports military families in San Diego while living out their faith and commitment to the Lord. Each year, the Memorial Day bake sale helps to raise funds for baby baskets and gifts at Christmas to support the Welcome Home program. The baby baskets are given to expectant mothers or spouses of military personnel at Miramar. 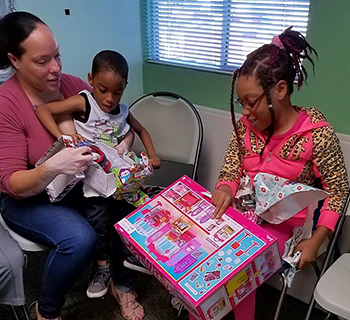 In the Welcome Home program mothers and children receive gifts donated by LJCC members. For information, contact the church office at Info@LJCC.org or call (858) 558-9020. Project Mercy has been improving the lives of the poorest and needy in the outlying neighborhoods of Tijuana since 1991. The San Diego non-profit constructs basic sturdy homes for the poorest families in the outlying neighborhoods of Tijuana, Mexico. La Jolla Community Church participates by sending members from the “Mexico House Building” with Project Mercy. 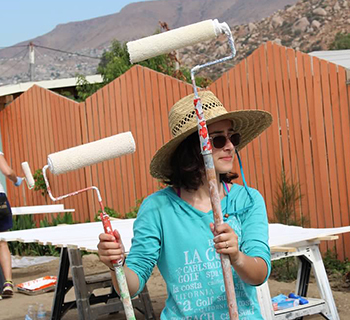 The Mexico House Building team has built over twenty homes in Tijuana over the years, including their participation in Project Mercy’s Baja Challenge. The reason behind building the homes is simple: inadequate housing leads to health hazards, plus a strong house is able to withstand environmental hazards. There are no homeless or temporary shelters or soup kitchens for those who are hungry and displaced. Residents fear for their children with each approaching winter because shelters cannot withstand high winds and icy conditions. Here’s how you can help: 1) be informed, 2) volunteer your time and resources, and 3) support the efforts with your financial gifts. La Jolla Community Church ministers to school children in Ensenada, Mexico who attend the Puente de Vida school. Puente de Vida (Life Bridge) school is a ministry of Rancho El Refugio in Ensenada, Mexico. Puenta de Vida was founded in 2011 to provide hope and a future to the disadvantaged children in the Ensenada area who are subject to the debilitating effects of extreme poverty. Today, Puenta de Vida provides a full grade school program, from preschool to grade 9 in their new Jr High program. Our involvement has been in partnership with Rancho El Refugio and Lazarian World Homes to build classrooms specifically designated for the school children. Students and families who attend La Jolla Community Church minister to the children and also help build the classrooms. The students are largely from the disadvantaged area of Ojos Negros. 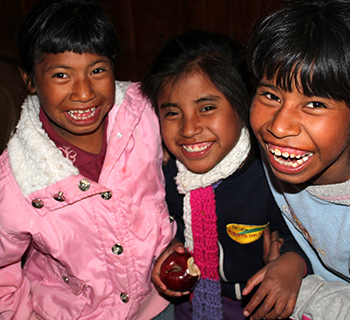 Puente de Vida is committed to breaking the cycle of illiteracy and poverty in these families. Join us by praying for them, serving them, and helping them provide a Christian education to their children. Contact the church office to learn more or to get involved at (858) 558-9020. 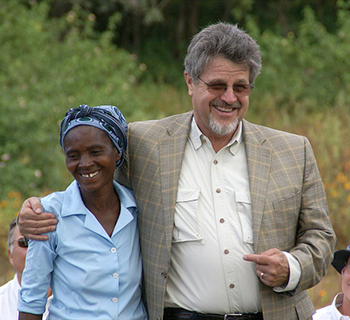 Y-Malawi brings people together in community with each other and with God. This true, deep, meaningful connection can heal hearts, transform lives and change the world. The central tenet of our work is supporting local African ministries who know their communities and people best. This model results in sustainable development and discipleship that is impacting lives now and for eternity. You can participate by going on a ministry trip. That is what we’re called to do if we want to inherit eternal life. It is our big chance in life. It’s our ticket out of the fall and into the Kingdom. When we end up with our back up against the wall (surely this will happen at times) – let us pray we do not forget that we are lovers of God and neighbor and so then the way forward is this. In this endeavor we can always succeed. This is the soul-anchoring hope of Christ winning out in our lives. In this endeavor we may succeed whenever we desire. This is the love of Christ in us. This is the promise of the cross. Love of God and neighbor is what fulfills our lives – it is the race and prize. So “set out towards justice” as Steve said. Form, further and fulfill relationships with your neighbor and yourself until the particularities of whom God desires to be becomes clear. Remember: relationships always resolve themselves into particularities. If you aren’t sure where God is in your neighbor’s life or your own, it’s an optics problem. You aren’t close enough to see. Ours is a multi-layered community, replete with many hiding places. We can hide in our cars, behind our front doors. We can separate our public lives from our private ones. The real concern in this is, how much does this erode our sense of community? What’s most noteworthy is this label is given according to your actions and behavior witnessed by others. How wonderful is that? Consequently, the essence of community is working with and beside others as disciples of Christ to carry out his will. As Pastor Steve pointed out, thriving in community can include everything from surfing to sleeping, from laughter to lightheartedness to love. The takeaway is, love creates community through relationships. And community is a gift from God.